On Thursday the British Horseracing Authority (BHA) announced that there would be no racing until Wednesday at the earliest. You will be pleased to know. It’s not my intention to go through all the technicals of last weeks events, as they have been fully covered elsewhere. As of the time of writing this post on Sunday evening. What do we know about the situation? Well one third of the 2000+ horses being tested by the Animal Health Trust for equine flu have tested negative which is encouraging. Still that means that two thirds have still to be tested. Given the amount of horses still to be tested it’s hard to think that the BHA will be in a position on Monday to give the green light to resumption on Wednesday. However, what does the BHA do if a few cases are found? That’s when we move into uncharted and worrying territory. The BHA have now created a precedent. If there are more cases of equine flu will racing remain in lockdown? In the first 24-hours of the outbreak there was a general consensus in the racing community that the BHA had acted quickly and decisively. That consensus started to break down on Saturday. First, we had Nigel Twiston-Davies telling the Racing Post that the shutdown was a “massive overreaction”. Then other trainers also began to question the BHA’s decision. Charlie Mann told the Racing Post on Sunday. “We get colds and sniffles and I completely agree with Nigel Twiston-Davies – it's absolutely ridiculous. We've got a cold and they're stopping racing because of it”. Then unconfirmed reports began to emerge that the BHA were advised by the Animal Health Trust not to suspend British horse racing, on their initial findings. By then the authorities had already locked down yards and courses. The uncertainty is what is most worrying for those involved in the industry. One has to have a certain sympathy with the views put forward by Gaye Kellaway in the Racing Post when she says. “I think they should have immediately said no racing until March 1 to really stamp it out – like DEFRA did with foot and mouth”. I have to say this is what I was expecting when the story first hit the headlines. Such a move would have at least dealt with all the uncertainty as to when racing would resume. So, where are we now? I’m cautiously optimistic that racing will resume sometime this week but I don’t think the BHA will be announcing on Monday that its returns on Wednesday. Hopefully, next Monday I will be reporting on some top-class racing that has taken place at the weekend. There was horse racing over the weekend at Naas, a shocker of a card, which ITV covered and on Sunday at Punchestown. The Naas card was a weak one for a Saturday but there were a couple of notable performances. The Martin Brassil trained City Island confirmed his well-being for a tilt at next month’s Cheltenham Festival. He only won like a 1/5 shot should win but at least his preparation couldn’t have gone better. The 2m 5f Ballymore Hurdle is the 6-year-old’s target and he goes there a big contender. He’s as short as 8/1 for the race. However, Coral and Ladbrokes are a standout 12/1 which looks solid each way value to this particular pundit. If he was trained by Mullins or Elliott, he would be half those odds. Band Of Outlaws, trained by Joseph O’Brien, a useful flat handicapper for the trainer. Continues to impress as a juvenile hurdler. He built on his Limerick win with a takin success on Saturday. His tactical flat speed came to the fore in a race that wasn’t run at a fast pace. Still on a day when it wasn’t easy to make up ground from the rear. Band Of Outlaws managed to do so. His better fancied stablemate Konitho could only finish 5th. A combination of the slow early pace and good ground did for him on this occasion. The winner will probably head for the Fred Winter Handicap Hurdle at Cheltenham. I just wish connections would let him take his chance in the Triumph Hurdle. The second home, Maze Runner and third Coko Beach could also head for the Fred Winter. I wouldn’t be surprised if the winner of the Fred Winter comes from Saturday's race. If racing does return by the weekend, we have some good races to look forward to. There’s every chance that last Saturday’s Newbury card, including the Betfair Hurdle will be rescheduled. 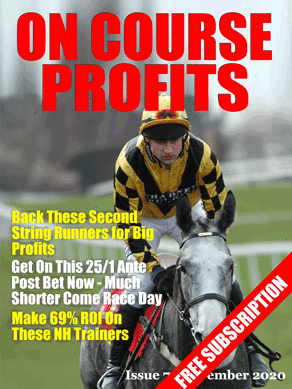 There are also good cards at Ascot, Haydock and Wincanton to get stuck into. The feature races on the Ascot card are the 2m 5f Grade 1 Betfair Ascot Chase and the normally informative Grade 2 Reynoldstown Novices' Chase over 3m. Meanwhile at Haydock there’s a good-looking card of races with the highlight being the 3m 4 ½ f William Hill Grand National Trial Handicap Chase (Grade 3). At Wincanton it’s Kingwell Hurdle Day, with the feature race being the Betway Kingwell Hurdle (Grade 2) over 1m 7 ½ f.
I am really looking forward to Saturday’s William Hill Grand National Trial Handicap Chase. The bookies have Robinsfirth and Wakanda. The first and second in the Peter Marsh Handicap Chase at the head of the ante-post betting for the race at around 7/1. Not far behind on a best priced 8/1 is Welsh Grand National runner-up Ramses De Teillee. The claims of all three are obvious. However, it may pay to look beyond those two for the shortlist. The ones that look interesting at this stage are in no particular order: Ms Parfois (20/1), Beware The Bear (20/1), The Dutchman (16/1), Sharp Response (16/1), Impulsive Star (12/1) and Big River (25/1). Good luck with this week’s punting. I bet anything you like, these silly old gits at the BHB, have never been near a poxy horse in their lives. A further update to my article in the light of the positive cases out of the Simon Crisford stable. I don’t think that the Crisford case means that racing remains in lockdown. Fingers crossed the BHA will have the sense not to let this affect the resumption of racing. 1. Given the small amount of positive cases found. It shows the vaccination process is working. 2. The BHA now know what virus they are dealing with, how widespread it is, not very from the figures and how serious it is, again not serious from the figs. 3.The Crisford positives are not linked to McCain. But for the testing would Crisford or any trainer have tested their horses for equine flu? I doubt they would. Instead they would have put it down the time of year as horses get temperatures and runny noses, etc. In fact in any normal February if the BHA did samples of 2000 horses in training. How many would come up positive? I suspect a similar number to what they have found now. The BHA now know that holding racing meetings isn’t spreading the virus. For me there is no reason why racing can’t resume by the end of this week. Will the BHA grab the nettle? I don’t particularly like Nigel Davies’ attitude. The perception he portrays is one where he and his income are more important that the welfare of the horses under his charge. It may only be a bit of a fever and some snuffles but to race competitively when not in the correct degree of fitness can have negative consequences. For example, a horse might be OK for a canter round a field but being ridden on the track with flu, it may not have sufficient reserves to make all those jumps. Consequently the risk of falling increases and hence the chance of a fatality. Given recent arguments around horse welfare, particularly at Cheltenham, one would expect an experienced high-profile trainer to exhibit a tad more caution and choose his words with a degree of wisdom and respect.